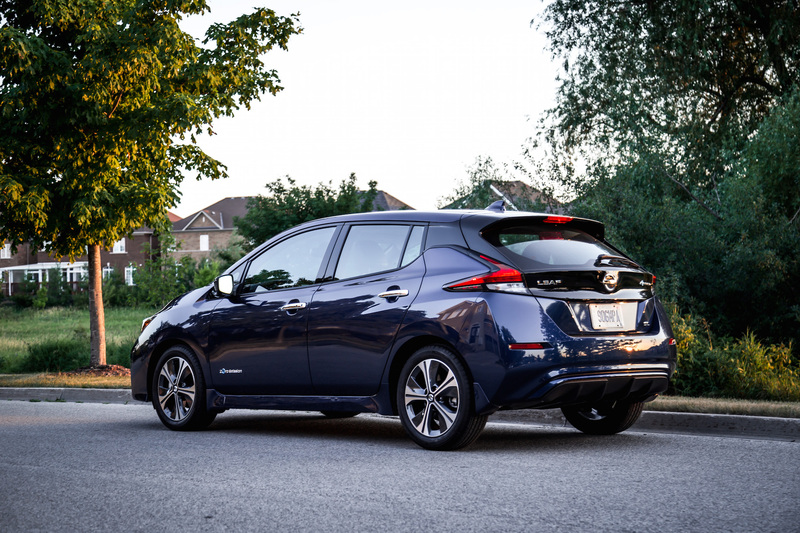 The Nissan Leaf has been steadily improving year after year and 2018 proves as no exception. 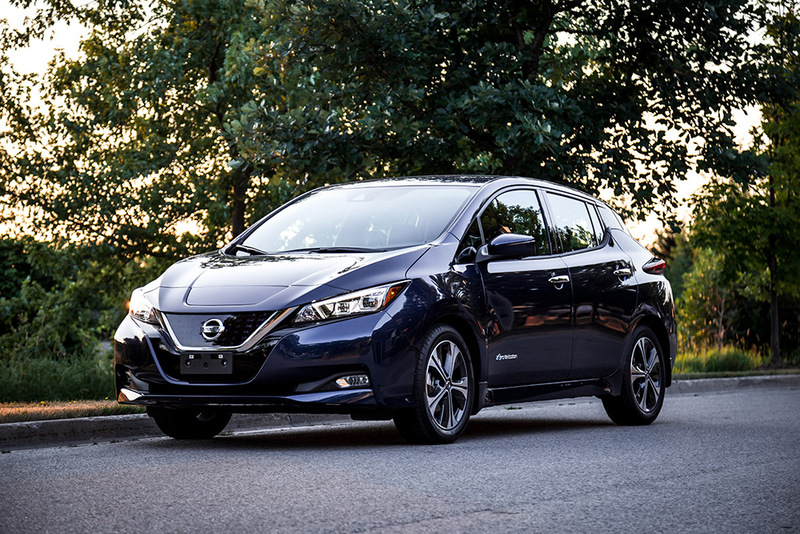 More range, more power, more technology, and more standard features give Nissan’s fully electric hatchback a considerable edge in this audacious and forward thinking segment. In fact, Nissan has already announced that they will offer a higher priced version in 2019 with even more range and more power. Now that’s confidence. But back to the 2018 Nissan Leaf at hand. A new lithium ion battery has been installed, which was the same size as before but has increased energy density. 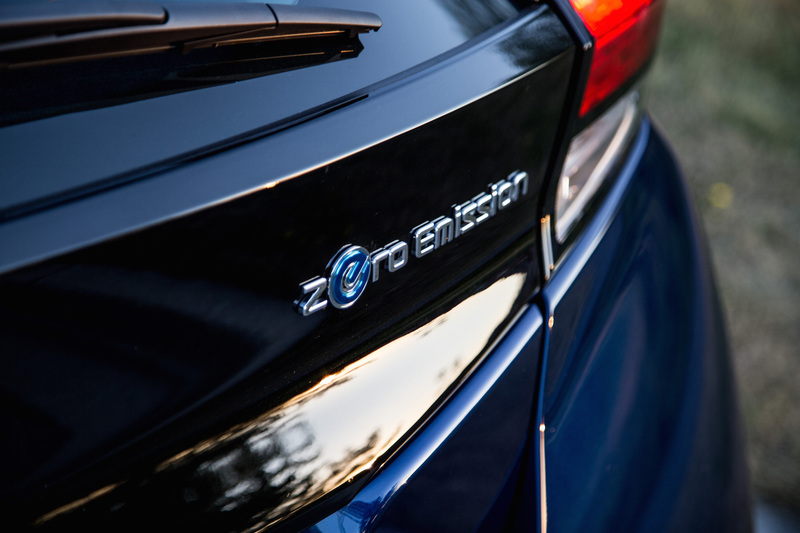 This allows the LEAF to hit a maximum range of 242 km, 70 km more than the outgoing model. Power is also up considerably to 147 hp and 236 lb-ft (40 hp and 49 lb-ft more than before). 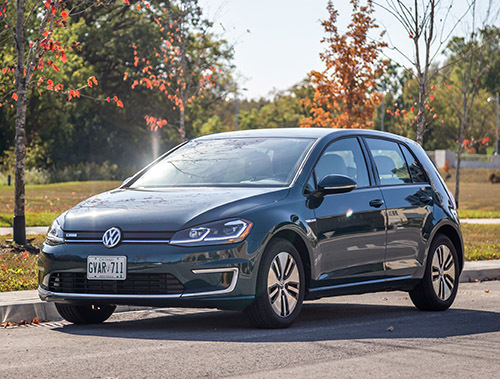 Three trims are available: S ($36,398), SV ($40,298), and SL ($42,698), the latter of which we tested and came with features like leather seating, Bose audio system, and a 360-degree camera. The Ontario government will offer a full $14,000 incentive for any trim. A slight nip and tuck has been added to the books, transforming the Leaf into a more handsome hatchback that wears the corporate styling set forth by the high-in-demand Rogue. The Leaf appears clean cut if you ask me and less awkwardly designed than the last one, almost as if it finished puberty and sprouted into a grown adult. It not only appears more purposeful but that new V-motion grill is pulled off with a distinct sense of maturity. The same can’t be said about the interior. 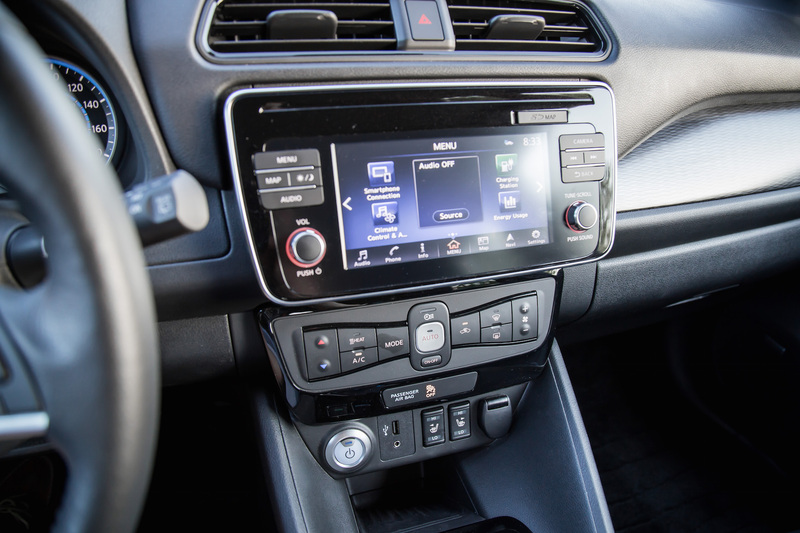 Nissan tries to pull off a futuristic high-tech look but it doesn’t quite hit the intended mark with rampant plastics and loose switches. It’s not exactly tall people friendly either. Why you ask? Firstly, the seats. They are very small lengthwise, so thigh support is pretty much out the window. The passenger side has a deep footwell but width-wise, space is incredibly tight because of that huge hunk of plastic sticking out of the center console for no apparent reason. The steering wheel does not telescope either, it only tilts, denying comfort for those who like to lean their seat back. The seating position is incredibly high up as well, to the point where the rear view mirror actually blocks my entire right side view out the front windshield, so I have to squat my head down to see if there are any vehicles when changing lanes. Blind spot monitoring can’t help with that. 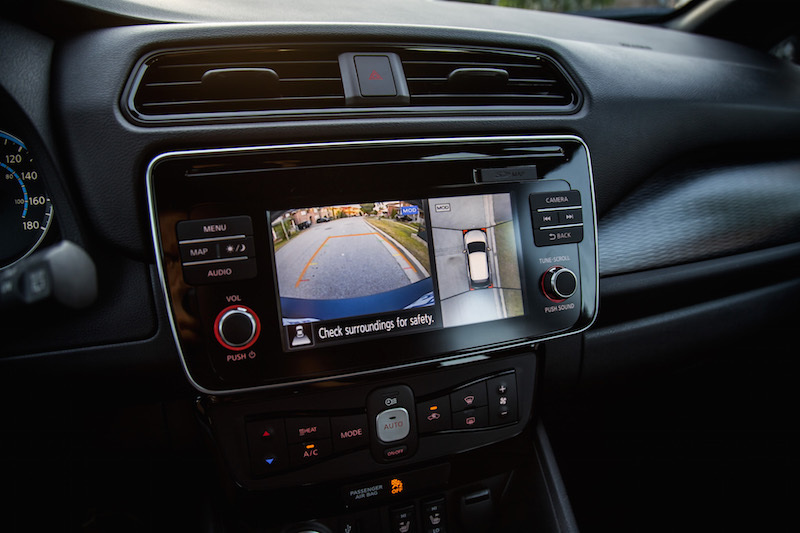 But speaking of safety, Nissan does include a fair amount of driving assistance features with the Leaf, including automatic emergency braking, rear cross traffic alert, adaptive cruise control (coined as ProPILOT Assist in Nissan’s dictionary), and even a 360-degree camera. 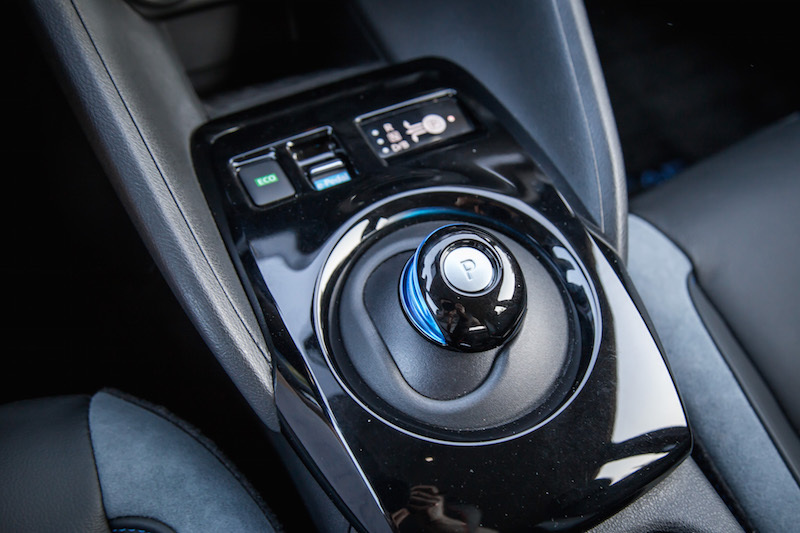 The gear shifter is an interesting affair, like a floating orb. Luckily there’s a diagram above it showing you how to move the orb to shift into the correct gear. On that note, the Leaf will emit a rather annoying and continuous beep when you are in reverse gear, like those forklifts at Home Depot. 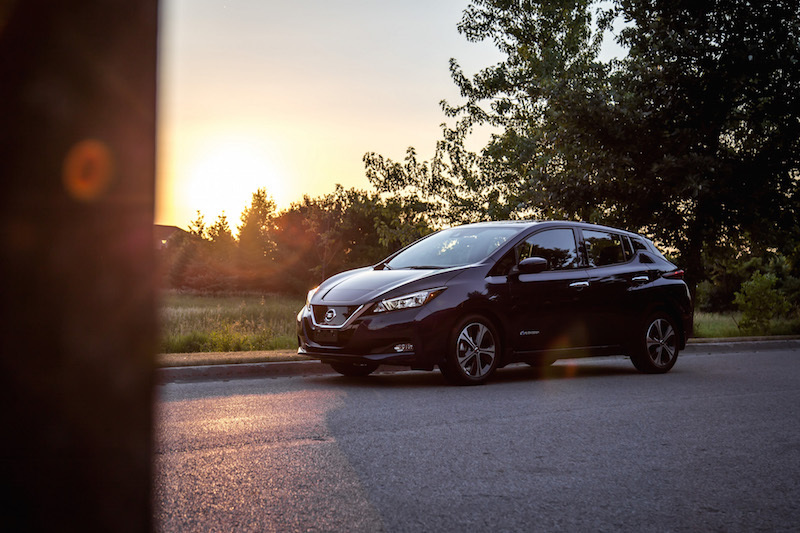 Yes, the Leaf is a stealthy ninja that needs to make its presence known to careless pedestrians who have a tendency to fall prey to Darwinism, but it makes this Nissan feel more like a service vehicle than Pink Panther. 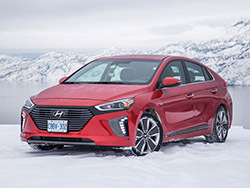 Standard features (exclusive to Canada I might add) include heated front and rear seats, a heated steering wheel, and a battery heater. 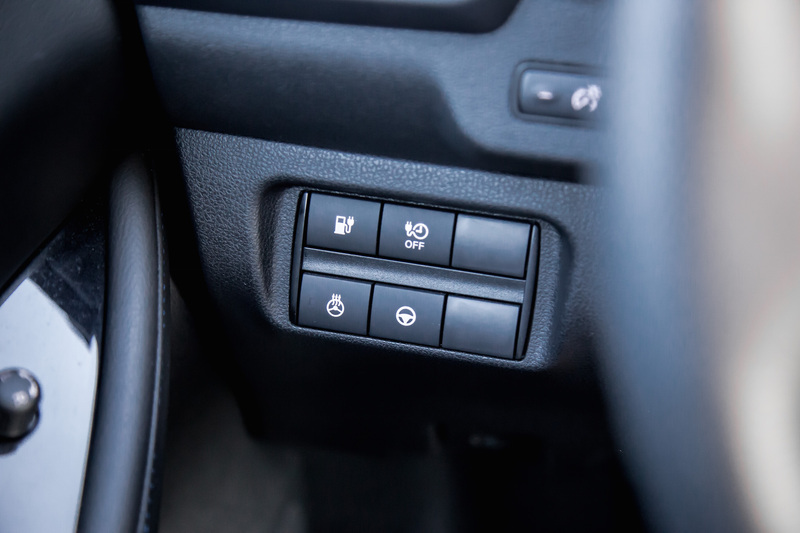 One note about the heated seats though, is that the actual switch to turn them on are located on the outer seat side bolsters, a rather odd and unergonomic place. How does the Leaf drive? It’s got some manners around town. Power is plentiful and offers just enough accelerative force for drivers to feel confident when overtaking or making quick maneuvers. The uprated power figures don’t go unnoticed and the Leaf is capable of steadily building up speed even after hitting 100 km/h, but I wouldn’t call it spritely. Steering is nothing to write home about, neither are the spongy brakes, but the suspension tuning is impressive. 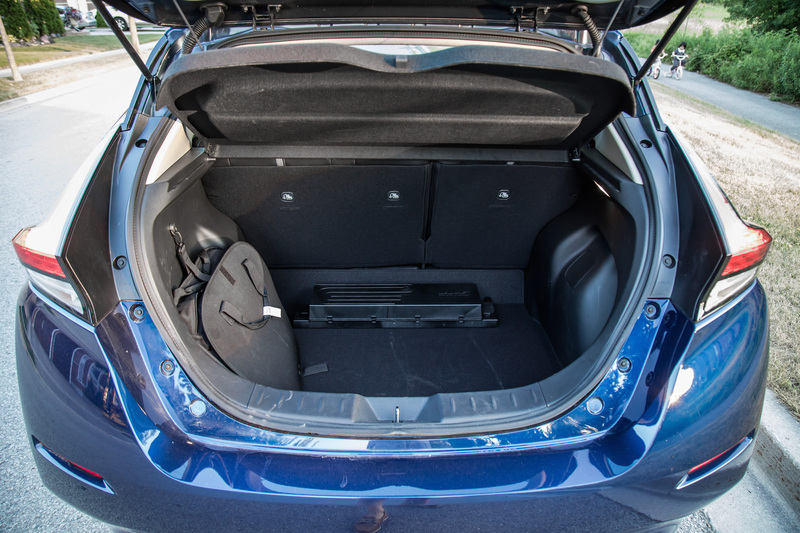 The Leaf stays fairly flat around corners, and notably has reduced body roll and lean from the outgoing model. Driving over bumps or potholes isn’t jarring either and settles well on undulating roads. 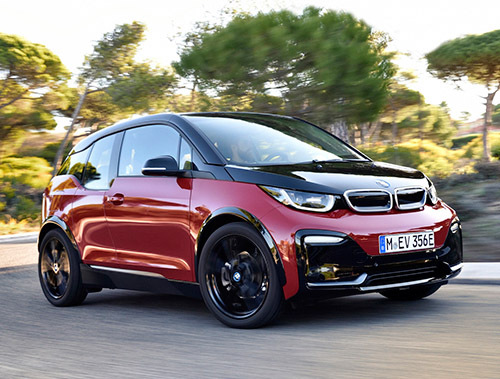 I wouldn’t go so far as to call the Leaf fun to drive, but if you are looking for a better handling EV, best to check out the BMW i3 or Volkswagen e-Golf, both of which are phenomenally exciting in the bends. Nissan has added a new feature called the e-Pedal and when activated, will ramp up the force of the regenerative braking up to the elevens. 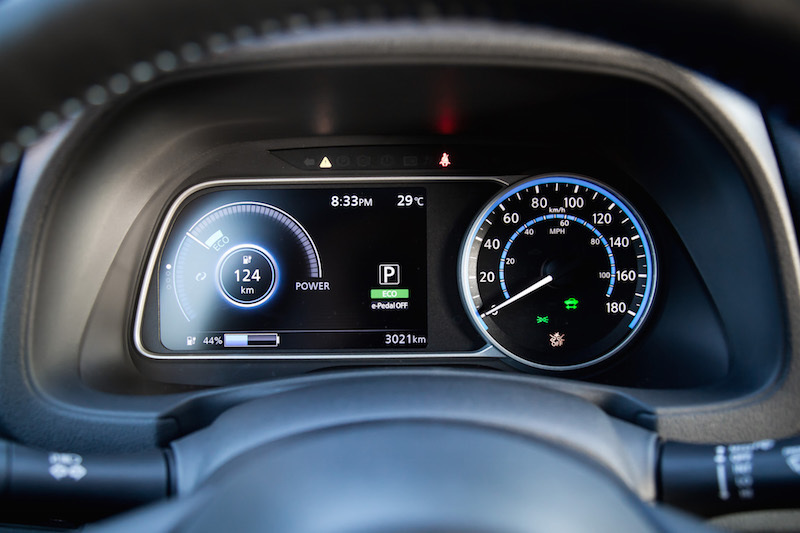 This essentially allows you to drive using only the gas pedal, as letting off the pedal will dramatically slow down the vehicle and eventually to a halt. The learning curve is mild, though using it smoothly (ie. without launching passengers into the windshield) does require a bit of right footed finesse. 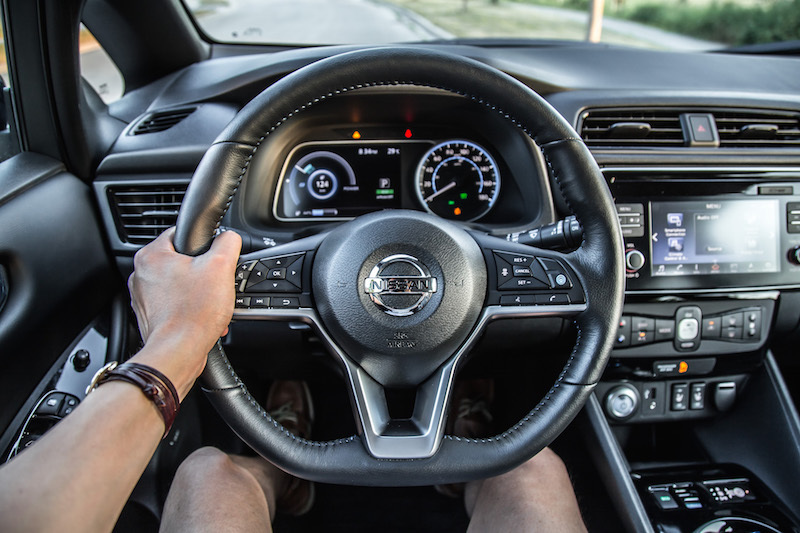 I would have preferred if Nissan actually put the e-Pedal button on the steering wheel for easier access rather than far up on the center console, and an option to customize the force of the braking (like how they do on the Honda Clarity) would be a clever addition as well. 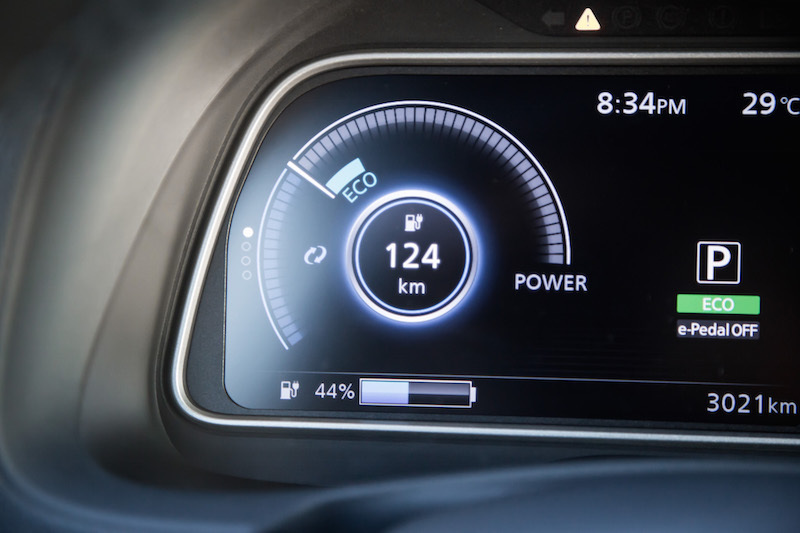 Every driver’s range will differ, but with our roughly 80% city and 20% highway driving, one full charge lasted us 245 km. This was in 25-30 degrees Celsius weather with air conditioning on full blast. 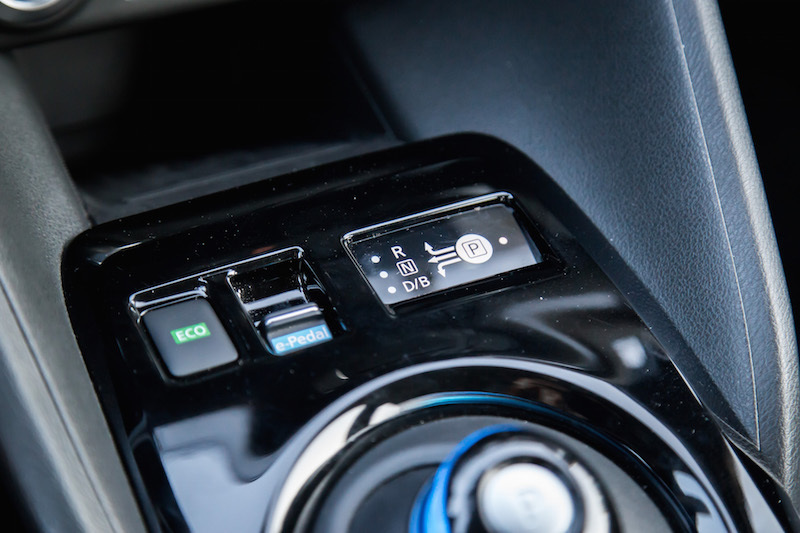 Of note, standard fare includes both a Level 1 and Level 2 charger cable, and both slots are available on the Leaf’s front charging port. A full charge on a standard household outlet will take over 24 hours. With a Level 2 charger, you’re looking at 7.5 hours, while a Level 3 will do it in under an hour. 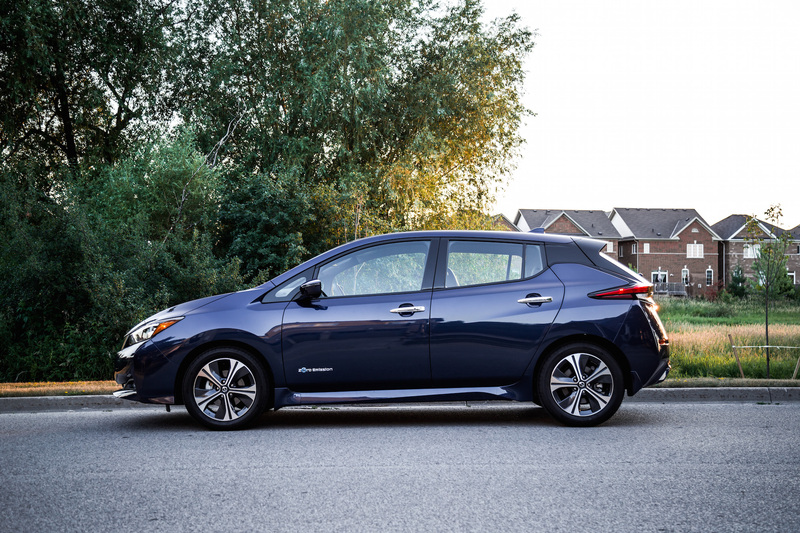 If the range of the 2018 Nissan Leaf does not immediately satisfy your needs, perhaps the higher priced model in 2019 might. 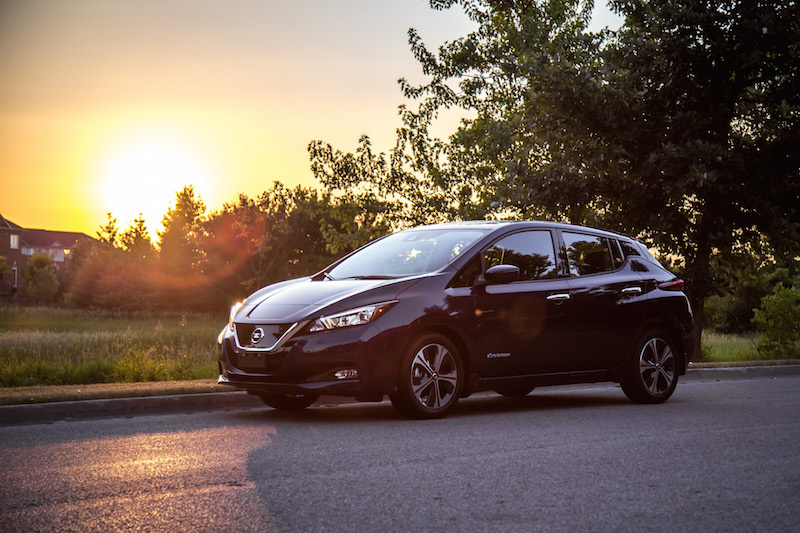 In the meantime, the Leaf is a compelling choice that notably stands out from the field with handsome styling and an impressive range. 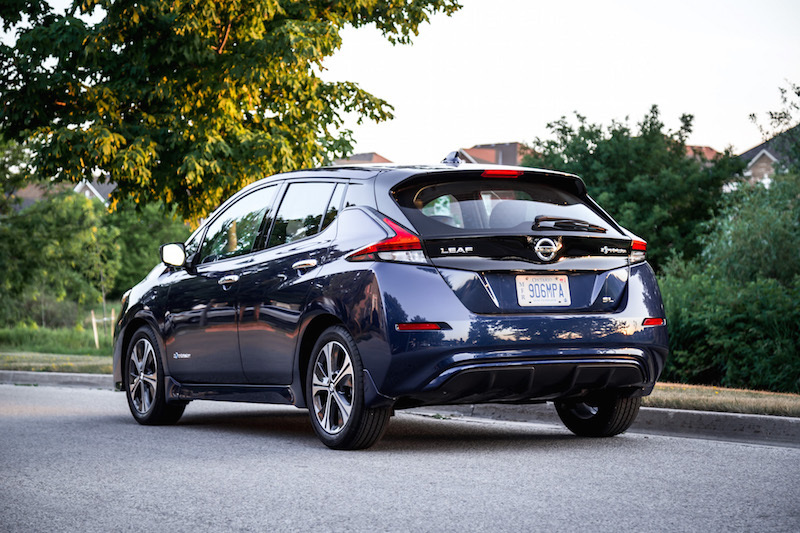 Though it may not compete with the higher-ranged Chevrolet Bolt or Tesla Model 3, the Leaf gains an advantage with a lower price tag. 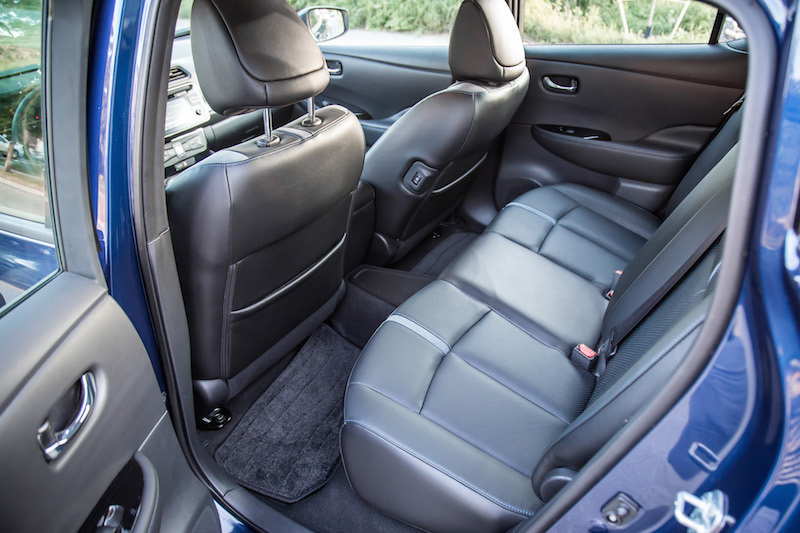 Its cabin materials and layout needs some garnish, and the seating position is unappealing for taller folks, but when you consider value, practicality, and standard features alone, the Leaf is undeniably worth the compromise.